It’s not all that uncommon that someone watches a video the content of which intrigues them to the point that they’d like it transcribed, or that someone is using a video as a source for a paper or project and needs it to be transcribed, but for whatever reason that transcription is necessary, it’s always going to be a fairly menial and challenging task. Video transcription, to put it simply, is just very tedious and uninteresting work, and on top of that it’s also a lot more difficult than most people expect. Few people can type as fast as speech, and fewer can do so accurately, and unless you can do both then video transcription is likely going to be a challenge for you, regardless of the quality of the video you’re transcribing. You don’t have to spend forever trying to transcribe it yourself and you don’t have to let the quality of your transcription service suffer, not with the help of our professional video transcription service! Video to text transcription is a long process, one which you must maintain focus if you want to do your transcription accurately, and we better than others understand that few people have this kind of time and effort to spare, especially on something so tedious, and our professional video transcription service is here to take the burden off your shoulders! No matter what kind of transcription video you need, we’ve got experienced and skilled professionals who can flawlessly transcribe any content you throw at us. All you have to do is send in the content you need transcribed with any special conditions (different languages, accents, poor quality, etc. ), give us a date, and our professionals will get right to work to make sure you have it in your hands by then! 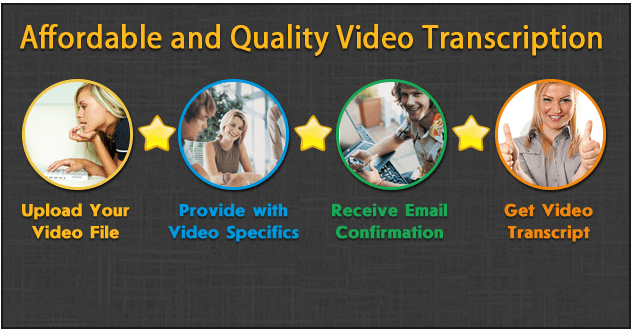 All the video transcription services you need and more! Our service is here to help you with whatever you need, and to get you this help with no hassle and no difficulties that other services out there might cause you. Many people avoid video transcription services and online services of this kind because they can be unreliable and difficult to work with, but our service is the exception, because we have a commitment to getting you the highest quality assistance and transcription on the internet that isn’t matched by anyone else!